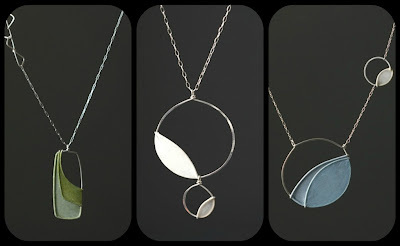 Tia Kramer, jeweler extraordinaire was born and raised in the heartland of Iowa, schooled in the fine arts in Chicago, braved living in Antarctica for work and lucky for us ended up here in the Emerald City. We are so fortunate our paths crossed because not only is Tia an amazingly talented artist but she is one of the best people to know. 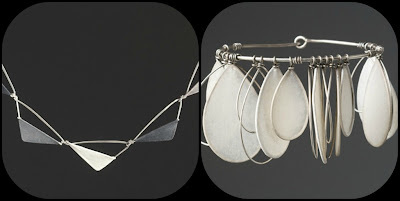 Tia, a paper maker by trade got the idea to turn her large scale paper + metal sculptures into smaller pieces of wearable art. 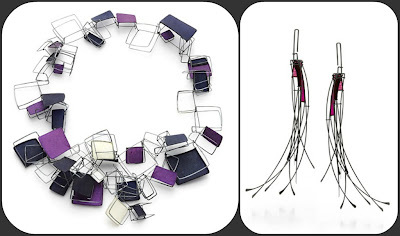 Extremely Calder-esque in appearance Tia has captured the interest of the top Museums and Art Galleries around the country where you will find her unique wares for sale. 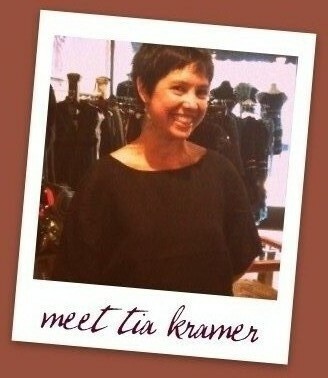 Tia's process is very laborious but don't we all know that a lot of hard work always yields the best results! Tia begins by working with pulp from the Philippine Banana Leaf Tree. She then mixes dyes to the pulp to achieve her extensive selection of colors. Tia hand forges contemporary shapes from sterling silver which become the bones of the her sculpture for which the paper will be attached. Each piece of paper is coated with multiple coats of a liquid plastic to protect them from the elements. 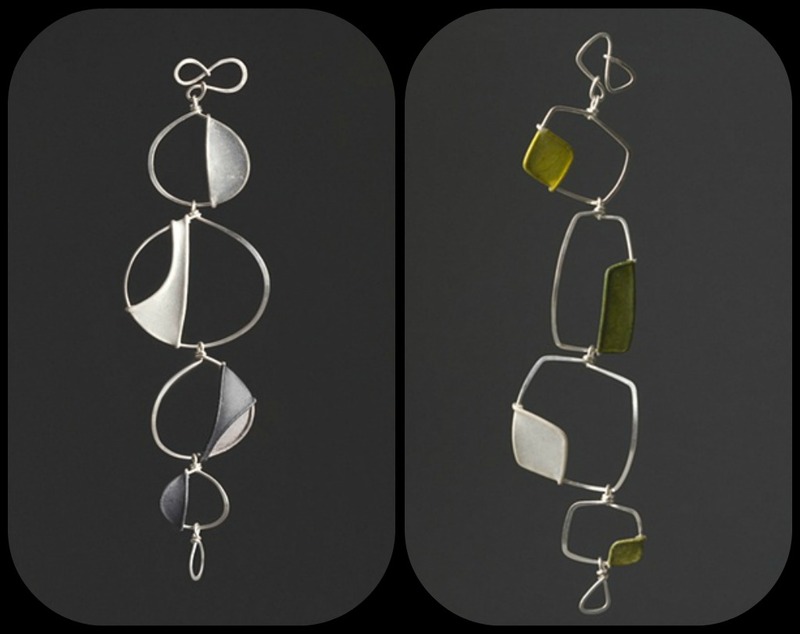 Inspired by our relationships to the natural and architectural environment, I create jewelry objects that make visible our interactions with structure and movement. My adornments are performative sculptures for one’s ears, architecture for the body. I look closely at our often unnoticed everyday lives: telephone wires suspended amidst tall evergreens, the negative space stretching between two neighboring skyscrapers. 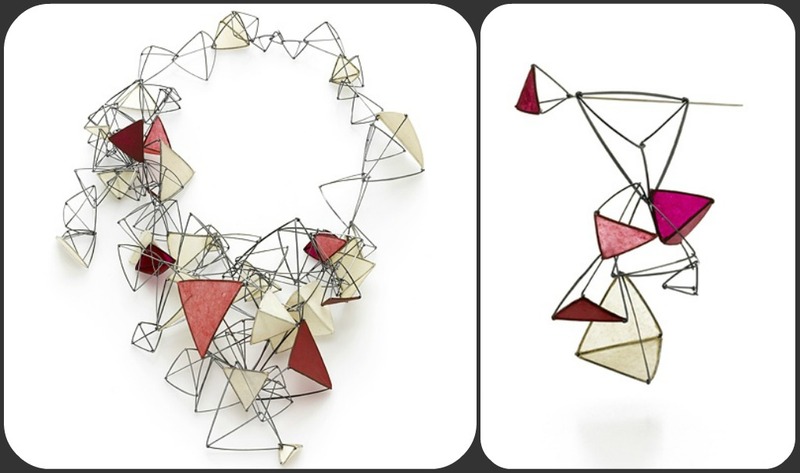 Using cold-form fabrication, I build organic and geometric wire forms that pare down these environments to simple line modules. These non-soldered jewelry structures move independent of one another, dancing on the ears, neck and wrists of the wearer. Like leaves on a tree limb, my adornments punctuate the wearer’s movement and expression.